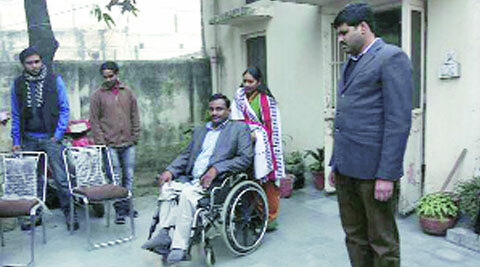 Dr. Saibaba is wheelchair bound, suffers from 90% disability and post-polio residual paralysis of both lower limbs. He poses no flight risk whatsoever. He is also a heart patient with blood pressure issues. Furthermore, he suffers from chronic and intense back pain as a result of the disability and being wheelchair bound. He has always cooperated fully with the investigation and did not need to be arrested. The National Human Rights Commission has already issued notice to the Maharashtra and Delhi police forces for violation of Dr. Saibaba’s rights in the course of the earlier investigation. Saibaba is being kept in a highly unsanitary, solitary cell, in darkness and with inadequate facilities. The denial of medication has resulted in constant pain and deterioration of health. Moreover, he is experiencing great difficulty, pain and indignity while using the toilet since it is impossible for him to use the Indian style commode that is provided in his cell. Given his fragile medical condition, we are particularly concerned for Dr. Saibaba’s well-being, and are apprehensive that, given his fragile medical condition, he may collapse physically in police custody. Your Honour, we are deeply concerned about the methods being adopted now by the police to silence voices of dissent. There are thousands of political prisoners languishing. There is a dire need for a more compassionate criminal justice system that will encourage the participation of the people in proving their innocence. There is also an urgent need to level the playing field, which is at the moment hopelessly prejudiced against the individual. Such an intervention can come only from a Superior Court. We look to you for justice and for the judicial protection of all such critical voices. We further appeal to you to intervene in the increasing criminalisation of voices of dissent and critique. On the matter of Saibaba in particular, given that he clearly poses no flight risk whatsoever, we ask you to initiate a judicial investigation of the matter and to issue an interim order immediately releasing him from judicial custody and back to his family.